Though the concept of a drone vehicle has been around for several decades — mainly in the context of military and war Drone Wars: How UAV Tech Is Transforming the Future of War Drone Wars: How UAV Tech Is Transforming the Future of War A revolution is taking place right now on the battlefields of the world: wars are fought increasingly by drones. Read More — it wasn’t until 2014 that consumer interest in drones really exploded. Now, people are coming up with all kinds of practical uses that are set to change our everyday lives. Drone applications can often feel too theoretical and “out there”. We know that drones have many incredible uses for the future 5 Amazing Uses for Drones in the Future 5 Amazing Uses for Drones in the Future Unmanned aerial vehicles, more commonly called drones, are now infamous for their surveillance capabilities, but like most tools, the usefulness of a drone depends on who's in control. 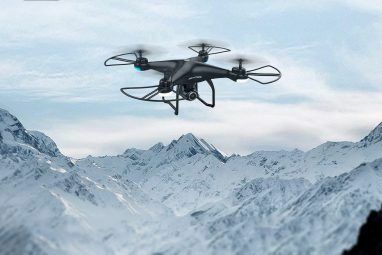 Read More and that they will soon revolutionize entire industries 7 Industries Drones Are Set to Revolutionize 7 Industries Drones Are Set to Revolutionize Seven industries that are ready and braced to be (mostly positively) impacted – if not revolutionized – by drones. Read More , but what about for you and me? What kind of tangible benefits can we look forward to? Several, in fact. We may still be in the infant stage of consumer drone technology, but it won’t be long before we reach that point when we’re wondering how we ever lived without drones in our lives. For those who weren’t aware, you should know that Amazon has long been working on a drone-based delivery system for its packages. 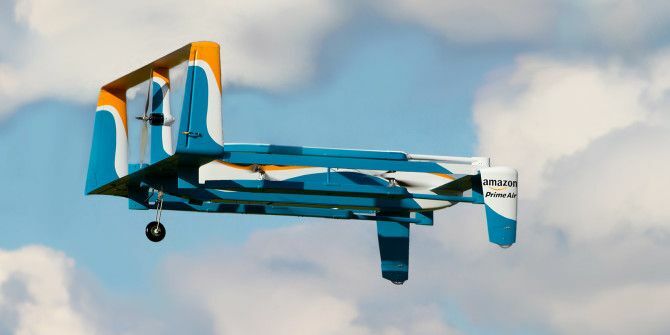 The ultimate goal of this system, which is called Amazon Prime Air, is to fly individual packages out to customers within 30 minutes of ordering. If they manage to make this a reality, it would end up being one of the best reasons to subscribe to Amazon Prime — on top of all the other amazing benefits you can already take advantage of 10 Awesome Amazon Prime Benefits You May Have Overlooked 10 Awesome Amazon Prime Benefits You May Have Overlooked Free two-day shipping is just the beginning. Here are some notable Amazon Prime subscription benefits you may not know about. Read More . The good news is that Amazon recently announced the ability to carry a five-pound package over 10 miles in under 30 minutes. In other words, this concept of drone-based deliveries is more than just a pipe dream. And it’s more than just a publicity stunt. Amazon is truly working towards making it happen, and the online retailer has made a lot of real progress in just a few years. There are still a handful of challenges and obstacles to overcome Will Amazon Drones Really Be Arriving at a Backyard Near You? Will Amazon Drones Really Be Arriving at a Backyard Near You? Amazon thinks they've cracked the delivery code. By using unmanned, automated drones, they'll be able to get packages into the hands of buyers in 30 minutes or less. Read More , but we’re staying optimistic. What’s really great about Amazon’s initiative is that it will pave the way for other services to start using drones for personal on-demand deliveries. Imagine new local startups that could deliver pizzas, beer, or even medicine to you in the blink of an eye. That last point is an interesting one. Consider, for example, if you had a lethal allergic reaction. Instead of driving through traffic or waiting for an ambulance, maybe a special healthcare service would fly an epi-pen to your location within minutes. Camera plus drone equals infinite possibilities. It was one of the very first ideas that people had when consumer drones exploded in popularity, and people are still coming up with novel applications for aerial photography to this day. Some of the results are beyond spectacular — so much so that you have to see them to believe them Latest Drone Photography You Have To See To Believe Latest Drone Photography You Have To See To Believe Drone photography is an exciting new technology that allows anyone to take awesome aerial videos. This article runs down some of the best on the internet. Read More . Drone cameras have been able to capture footage from angles and distances that were pretty much impossible until now. We’re on the verge of a new era in photography. But even if you aren’t creative, drone cameras have other uses that you may find indispensable. Think about photographic evidence. Dashcams were once considered unnecessary, but there are many stories of how those same dashcams have come in handy for all kinds of drivers. With the right kind of dashcam How to Choose the Right Dashcam for Your Car How to Choose the Right Dashcam for Your Car As you browse dashcams you may wonder why one would be desirable. What features do they offer? How are they different from a regular camera? Why not just use a smartphone? Read More , you could be protecting yourself. Not that you should use a drone as a dashcam replacement, but just as dashcam footage can help resolve legal issues Can Dashcams Stop 'Crash For Cash' Fraud? Can Dashcams Stop 'Crash For Cash' Fraud? The car in front of you suddenly brakes without warning... and you plough into the back of it. Read More , so can footage from drones. In a bad neighborhood, for example, you could use a drone to record a shootout or a break-in without putting yourself in harm’s way. Municipally speaking, drones could lead to safer streets through more dynamic public surveillance. Obviously this would raise concerns over personal privacy 5 Times Drones Have Breached Personal Privacy 5 Times Drones Have Breached Personal Privacy Drones are fun, but the increasing use of devices with mounted cameras poses a privacy risk in many places without drone privacy legislation. 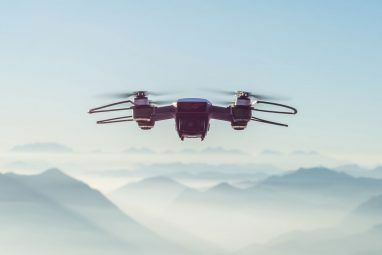 Here are 5 occasions where drones have breached the privacy of unsuspecting... Read More , but done properly, no one can deny that it would likely put a noticeable dent in rates of violent crime. On a more personal level, you could employ a handful of small drones to keep watch over your own property. Technology already exists that lets you set patrol paths for drones using GPS-based waypoints in 3D. This could be a possible next step for smart home security Safe and Sound: 4 Great Smart Home Security Devices Safe and Sound: 4 Great Smart Home Security Devices Read More . It’s no secret that many organizations are trying to use drones to better understand the atmosphere and the environments in which we live. In 2014, China vowed to fight pollution with drones, and in 2015, drones were used to measure pollution in the Peruvian Andes. On a more local scale, however, you may soon be able to gather data about air quality and conditions using your own personal drone. Send it up into the air and grab readings on pollen count, pollution levels, and even more mundane things like temperature and humidity. In short, drones could help monitor the air quality of a potential new residence, thus informing you on whether you should go through with the move (or whether you should leave your current residence). Speaking of residences, drone cameras — which we mentioned earlier — can also help you make the most informed decisions when choosing where to live. I know first-hand how frustrating it is to hunt for a new apartment How to Avoid Apartment and Condo Rental Scams How to Avoid Apartment and Condo Rental Scams More and more people are finding their next place to live through online services, and scammers have learned to take advantage yet again. Don't become the next victim. Read More , mainly because the photos are rarely true-to-life. Now imagine if real estate ads included a fly-through of the entire place using a miniature drone. You’d get to see exactly what the apartment looked like, and you wouldn’t be duped by manipulated photos that can make a place appear very different than it actually is. In 2015, Facebook announced that it had successfully created a solar-powered drone Facebook Is Bringing WiFi To The Masses With Drones Facebook Is Bringing WiFi To The Masses With Drones Almost two thirds of the world's population lack Internet access. Facebook founder Mark Zuckerberg seems eager to address this very real inequality with autonomous drones that will provide free Internet access. Read More that could theoretically stay between 60,000 and 90,000 feet in the sky for up to three months at a time. Each drone would have a ground reach radius of about 50 miles. With thousands of these drones working together, we’d end up with a network that could potentially provide Internet access to the entire world — and this could even be the first step that eventually enables us to end the stranglehold that companies like Comcast have on America’s Internet Here's How the New Internet Might Finally Kill Comcast Here's How the New Internet Might Finally Kill Comcast Many Americans want to see Comcast crash, burn, and receive a comeuppance for their bad service and worse support. But is such a fate even possible for a monopoly as big as Comcast? Read More . But global drone-provided Internet is still many years off into the future, so what kind of infrastructural benefits can we reasonably expect in the next few years? A major one will be improved maintenance and upkeep for roads and bridges. Think about it: when a road needs to be examined for safety and integrity, an actual person needs to drive out there in person. Sometimes, the examination even requires the shutting down of lanes or roads. It’s not as efficient as it could be. Bridges are even worse. In 2013, at least one out of every 10 bridges in the United States needed serious repairs or replacements, and even more bridges were structurally deficient. With drones, these problems could be detected faster at less cost and improve safety for everyone. Are You Going to Get a Drone? At this time, drones still fall somewhere between “luxury gimmick” and “recreational fun only,” but the tipping point is just around the corner, and when it does, you’ll want to be ready for it. That’s why you should start preparing now. Thinking of buying your first drone? 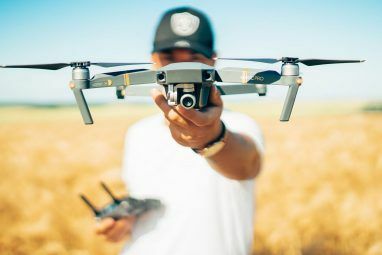 Here are a few important questions to ask yourself 8 Questions to Ask When Buying Your First Drone 8 Questions to Ask When Buying Your First Drone Buying a drone is equal parts exciting and confusing. Here are some common questions most beginners have when purchasing their first drone. Read More so you don’t make any mistakes or end up wasting money unnecessarily. Also, you should be aware of these common drone-related security issues 5 Unstoppable Drone Security Threats You Should Be Aware Of 5 Unstoppable Drone Security Threats You Should Be Aware Of Drones introduce a host of new security concerns that governments and legislation have yet to react to. We have compiled five quadcopter drone-related threats that are particularly worrying. Read More just in case. What do you think of drones? Are you excited or unimpressed? Will you dive into it immediately or wait a few years and see how it pans out first? Tell us your thoughts down in the comments below! Personally i would love it specifically for my business to deliver packages. Thanks fkhamza! Drones in Africa does seem much less likely than here in the U.S. I wonder if there will ever be an advancement that makes it possible? I guess we can only wait and see. "1. Receive Package Deliveries by Air"
Amazon may be working hard to make it happen but unless they bribe a lot of officials, it won't. "2. Improve Surveillance and Security"
Whose security? Drones are and will be the biggest threat to security. With a drone and a camera you can check out that blond couple of blocks over that sunbathes in her birthday suit. Your nosy neighbors can have their drones peek through your windows and check out what you and yours are doing, when and how. I hope your better half is not into spike heels and black leather and you don't wear a dog collar around the house. Burglars will use drones to ascertain their victims' daily routines. Etc., etc., etc. "3. Help Decide Where You Want to Live"
You sure you want to live with the sky over your house looking like the Santa Monica Freeway at rush hour because of so many drones? "4. Better Internet and Civil Infrastructure"
"With thousands of these drones working together, we’d end up with a network that could potentially provide Internet access to the entire world"
With thousands of these drones working together we will end up with something like a Dyson Sphere in our atmosphere. 2. In that case, I guess you could think of drones as defense against drones. You're right, lots of things to worry about, many of which we haven't even considered. 3. Well, for this point, I just meant that drones would be used to record fly-through videos (similar to how real estate agents take pictures of vacant homes). Not that people would be able to fly-through on demand, though that's an interesting thought! 4. Haha. That would be a LOT of drones.